A few years back designer Outi Korpilaakso decided to jump off the faceless fashion ride and provide customers elegant items with full transparency. Besides designing out of someone else’s trash, Lovia takes part in the pioneering work of developing new leathers from Finnsheep, elk and salmon. Designer Outi Korpilaakso got fed up with the faceless fashion world and decided to start a brand that had nothing to hide. 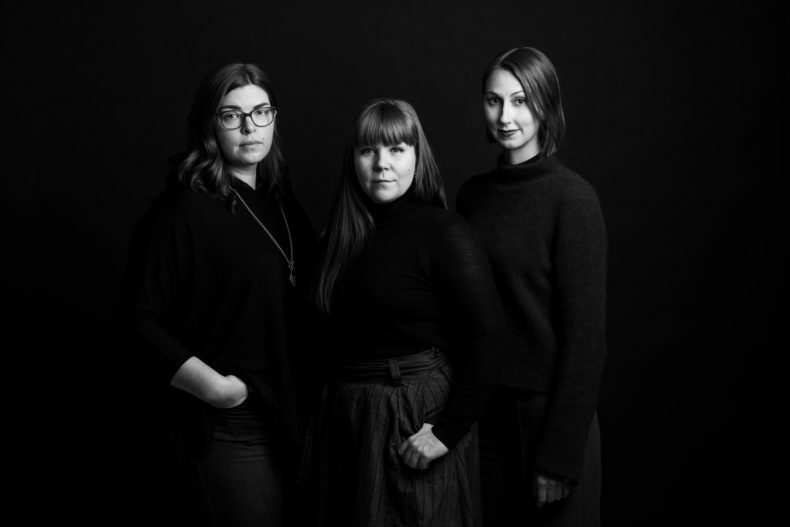 In 2014, Lovia was founded by Tiina, Outi and Anniina. Photo by Jussi Ratilainen. For several years, Outi had worked for an international department store as a designer. However, inside her grew an ideological conflict. She enjoyed the job, but at the same time, she felt powerless as she couldn’t know who made and in what conditions her designs were made. The feeling grew stronger, working-hours wore her out and finally, Outi decided to quit her job. Outi headed back to her second home, to a small town of Kuhmo, Finland, to figure out what she wanted to do. At her farmer grandparents, she was surrounded by nature and spent a lot of time wandering in the forests. There she tried to clarify herself what she could do or could she even continue do as a designer. Could she continue in the faceless fashion world? After a while, the young designer realised that she could design from waste, from already existing materials. She decided that in her designs transparency would play an essential role and there would be faces behind her products. The Lovia cone jewels are made by goldsmith Tero Hannonen. Photo by Jussi Ratilainen. Outi turned the traditional design process upside down. Instead of first designing, she decided that the materials come first. In 2014, Lovia, the high-end bags and jewellery brand, was founded. Outi’s teams’ mission is to utilise materials, which are left adrift in the world. So, they use excess and recycled leather, the by-products of the meat industry and cooperate with hunters. Due to its durability, leather was a clear choice in bags. She questions the vegetal footwear since they are plastic, which comes from oil. Not only is the manufacturing problematic, but also as waste plastic is a challenging material. Outi emphasises that to her the new luxury is transparency. Therefore, Lovia created the especially impressive, unique product DNA concept, which reveals the whole production chain behind each Lovia design from zippers to the leather used. Each Lovia bag carries an individual code with which it’s possible to trace down the material sources behind it even years later. In addition to full transparency, the DNA demonstrates the complexity of fashion industry and lights Lovia’s decisions made considering materials and makers. “With the DNA concept we want to show that neither materials nor products do not come from outer space”, Outi highlights her values. Lovia bags are manufactured in Clio Factory near Milan, Italy. 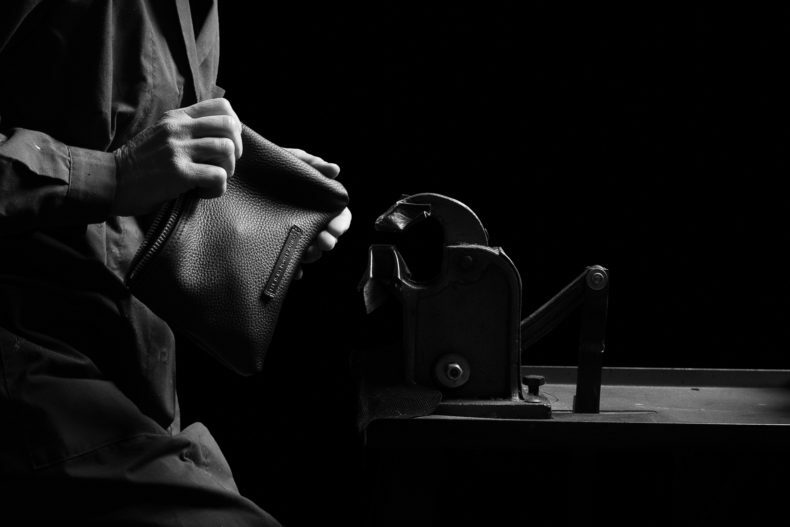 Founded by three artisans, Fulvio Galbiati, Jenny Boischio and Luisella Checuz, the team of nine professionals have the expertise to do even the most demanding techniques required in Lovia bags. Photos by Jussi Ratilainen. However, partners weren’t the easiest to find. Initially, the founders thought they could keep the production in Finland. Soon it turned out to be a challenge to find the expertise to produce Lovia’s bags in Finland, and now, the bags are manufactured at Clio Factory near Milan, Italy. There, artisan Fulvio Galbiati has over 30 years of experience in manufacturing designer bags and working for luxury labels, and his team has the expertise to do even the most demanding techniques. The materials available and used give food for thought every week since Outi and her team want to make the best possible decisions. Some of the leather comes from furniture industry and Helsinki re-use centre, but Outi states that they also want to source new materials. With their carefully selected partners, Lovia is doing pioneer work. For example, Lovia’s elk hides are supplied from Nordic hunters, a network gathered by Kokkolan tannery since 90’s. Other examples of successful material experiments are Finnsheep and salmon. A while ago, Lovia’s team realised that the Finnsheep’s skin is a leftover from food production and refining it, as leather ware, is a rather rare and small industry. Some of the leather of 60 000 sheep per year was going to waste although it’s a very soft and flexible material. 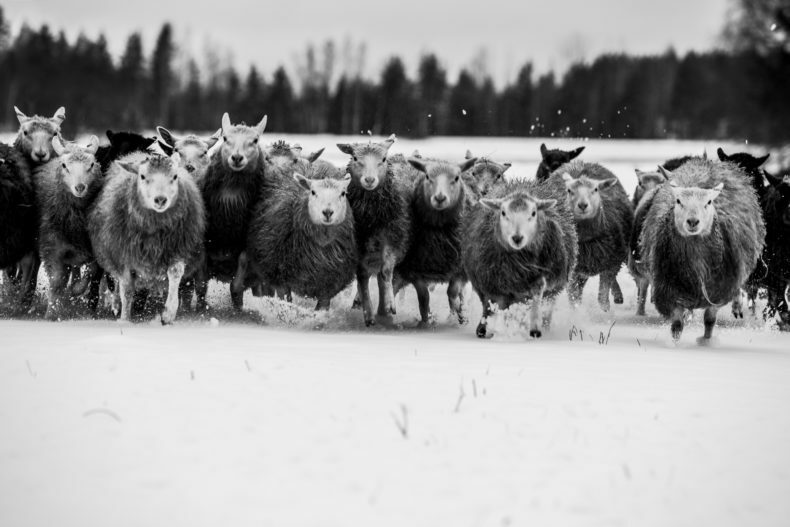 Now, Lovia cooperates with an organic sheep farm, located in Kalliomäki, Souther-Eastern Finland, where the sheep get to pasture freely and eat only the farm’s own organic oat, horse bean and hay. It’s crucial for Outi that the animals are grown and have lived in good conditions. 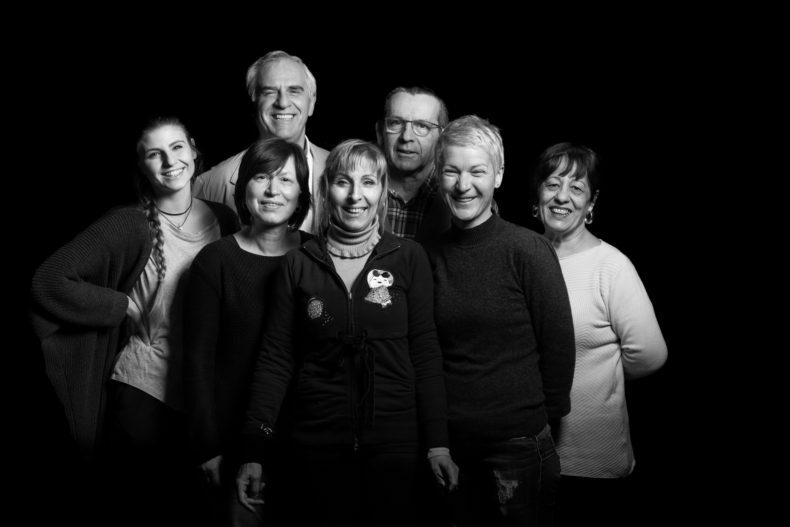 Lovia cooperates with an organic sheep farm, located in Kalliomäki, Souther-Eastern Finland. Photo by Jussi Ratilainen. Salmon skin, by-products of human food too, is Lovia’s newest material. Although in Iceland, where the salmon skin is from, fish skins have been used for ages to keep the fishermen’s feet dry and warm. “Exotic leathers are often produced from skins of endangered animal species, but salmon is a sustainable alternative. The visual effect is very similar to snake skin, and in addition to that salmon leather has a softer, more suede-like feel to it,” Outi explains. 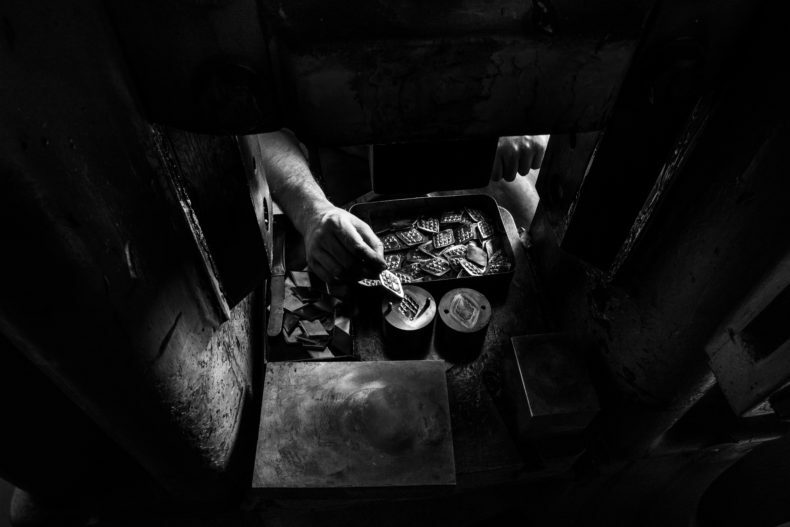 Ahlskog Tannery has almost a hundred years of experience of producing sheep leather. They follow the strict guidelines over environmental issues. Photo by Jussi Ratilainen. Leather tanning is another matter Outi gives a serious thought. Chromium and vegetal tanning isn’t a black and white issue. The better option depends on from which angle the issue is perceived. “Vegetal tanning makes the texture of leather harder, and the tanning substances usually come from South-America, not from our pines and firs. So to farm and get the colour, rainforests are destroyed. Then the tanning substances are shipped from faraway places,” Outi ponders. Outi highlights that the tanning itself needs the expertise to make and chromium tanning is a huge problem in countries with no rules or regulations considering the people or planet. The Lovia elk designs are tanned in Kokkolan tannery, and the Lovia Finnsheep designs are tanned in Ahlskog Tannery, in North-Eastern Finland. There the tanning process is a closed system, which means that the chromium, which is left from tanning, goes to hazardous waste. In Chromium tanning, 95% of the tanning substances absorb into the leather and the rest 5% remain in the water. These residues are treated carefully in Finland and the authorities check the chromium content in sewage water once in every two months. The Chromium residues from Kokkolan Tannery, for example, are transported to Kemi in Northern Finland, and there they are recycled into the raw material of asphalt. In vegetal tanning only 30–40% of the tanning substances absorb into the leather. So, if the residues are mishandled, the sewage water can cause eutrophication. Therefore, it is significant that leathers, either chromium or vegetal tanned, are produced in places where the tanning happens in a closed system. 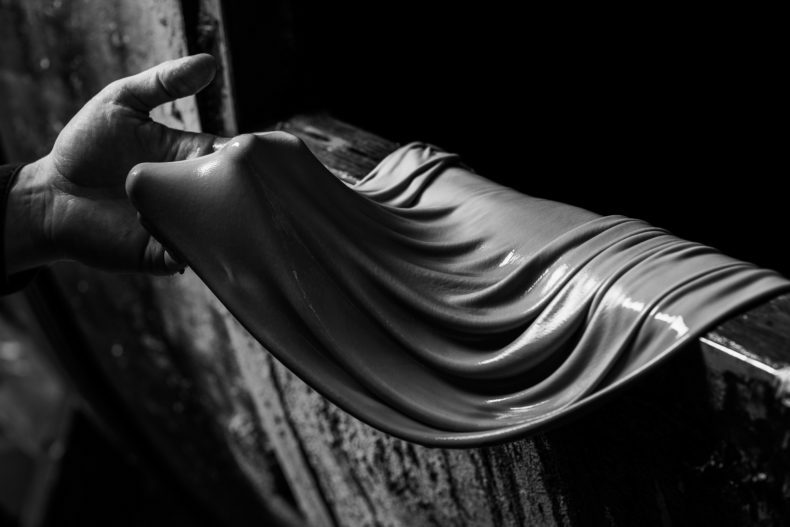 Ahlskog Tannery has not only almost a hundred years of experience in tanning leather but also has strict guidelines on environmental issues. For instance, producing one ton of leather at Ahlskog’s consumes around 12 tons of water, which is less than half of the EU guidelines. 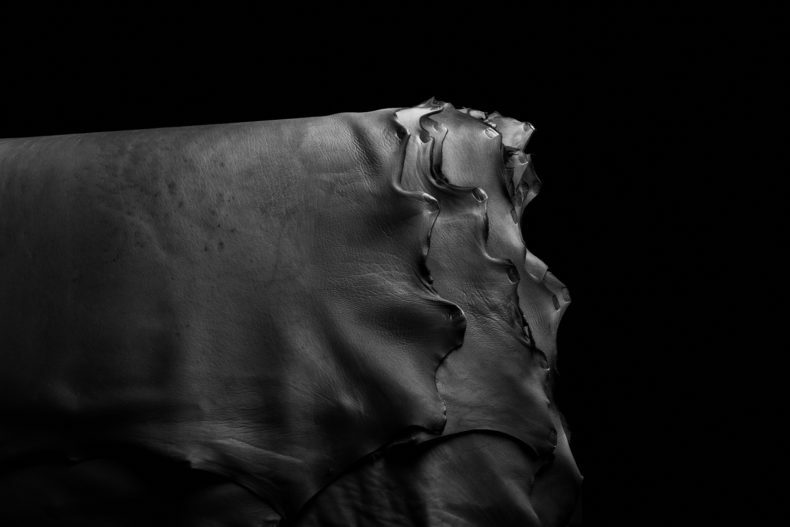 Before a rawhide can be used as a bag’s material, it must go through over 40 different stages. One of them is tanning. This Finnsheep leather is produced in Ahlskog Tannery in North-Eastern Finland. Photo by Jussi Ratilainen. “Tanning itself needs a lot of expertise. It isn’t easy to get both a beautiful surface and a durable material. For instance, the process of vegetal tanned elk is developed all the time,” Outi explains, valuing the professionals’ work high. Outi also points out that usually in vegetal tanning big orders are needed, and therefore, not all smaller brands have the option to use vegetal tanning although they would like to. The salmon skin is tanned in Iceland, in the small town of Sauðárkrókur. There renewable hydro and geothermal energy are used in tanning. 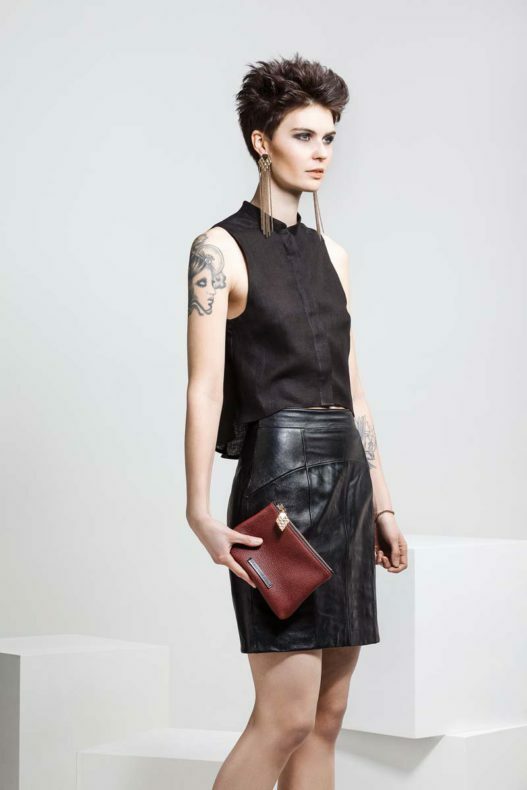 Aura bag from excess leather with recycled leather weaving, and the Oma Pouch from elk leather.